The Hayes-Suburban High School League brought their season to a close with the awarding of the league’s championships in their various divisions. Brooms were out in full force for the finals in in all three of the leagues divisions. All of the Championship series were decided in two game sweeps. In Junior Varsity, the league saw two championships decided. Lake Central (IN) and Spartans Green squared off in the Tier I division final battling for the league’s top JV prize the Hayes Cup. After reaching the finals last season Lake Central looked to stake their claim to the title this year. But the Spartans club would end up being the team to claim the Cup with a pair of well contested one-goal games. The Spartans would come from behind in game two scoring to tie the game with only 2 minutes left in regulation. Then with about five minutes gone in the overtime they scored the game winner and claimed their first Hayes Cup title. In Tier II division action the Spartans White team looked to keep a good thing going as they faced a much improved Lincolnway Red team for that title. Lincolnway just couldn’t find a way to stop the Spartans and they fell victim to them in a two game sweep giving the Spartans yet another JV title. To wrap up Hayes-Suburban action for the season it was the Varsity divisions’ turn to take center stage. The match up here found the AWFM Renegades seeking their third title in as many tries as they squared off against the Spartans varsity club. In game one it was all AWFM as they coasted to a 5-0 win. Game two found the action back in the Renegades home turf, the Edge Ice Arena. Hoping to spoil the Renegades party and extend the series to a third and decisive game, the Spartans came out a different team than the night before. However, it was not to be. AWFM took a two goal lead into the third period and they fought off a gallant effort from the Spartans to prevail with a 3-2 victory giving them a sweep of the series and their third consecutive Cougar Cup title. The Renegades join a select list of three-peat winners like the St. Charles East team of the late 1970’s and the Hinsdale Central team from the early 1990’s. The Cougar Cup is one of the oldest trophies in Illinois High School hockey. 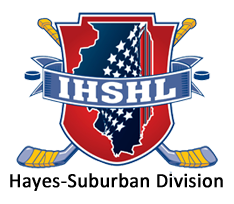 Now in its 46th season, the cup was presented to the then Illinois High School Hockey League by the Chicago Cougars WHA franchise. The league wishes to congratulate the champions and all teams that made their respected final series.